1. a cut or a wound made by a sharp instrument. 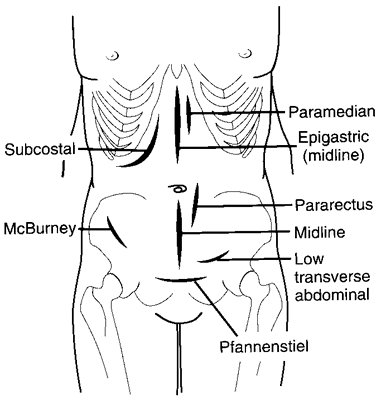 Various abdominal incisions. From Dorland's, 2000. 2. the act of cutting. A cut; a surgical wound; a division of the body parts, usually made with a knife. a. A cut into a body tissue or organ, especially one made during surgery. b. The scar resulting from such a cut. a cut produced surgically by a sharp instrument that creates an opening into an organ or space in the body. Surgery A cut in the body during surgery. See Fishmouth incision, Kerr incision, Kronig-Selheim incision, Lazy-S incision, Mercedes-Benz incision, Pfannenstiel incision. A cut; a surgical wound; a division of the soft parts made with a knife. A surgical cut made to achieve access or to allow discharge of unwanted material such as pus. The placement of surgical incisions is often a matter for judgement involving considerations of subsequent wound strength as well as good access. A cut; a surgical wound; a division of the body parts. n the act of cutting or biting. n See I and D.
n the phase of the masticatory cycle, using the incisor teeth, that cuts or separates the bolus of food. n the incision of the soft tissue anterior to the external ear that permits access to the temporomandibular joint. n a cut into the soft tissues adjacent to a wound to permit a tension-free closure. n the incision of the soft tissues in the area of the mandibular angle that permits access to the lateral surface of the mandibular ramus, subcondylar neck, and condylar area. one described as firm and free in action so as to cut through the skin in a minimum of motions, rather than multiple short, light strokes. a surgical approach through a flank incision in horses and cattle in which the several muscle layers are separated in the direction of their fibers, each of which is different, and the peritoneum is incised in a vertical direction. Called also a modified McBurney incision. one located near the midplane, most commonly parallel and close to the linea alba. one made to allow movement of skin for closure of a wound or parallel incision. made with the point of a scalpel. The severity of post-operative pain is influenced by numerous factors such as anaesthesia, analgesia and the technique of surgery, including the method of incision of tissues. To our knowledge, this 'Goldilocks effect' of surgical incision length on pain outcomes has not been previously reported, and merits further investigation to unravel the effects of short-term tissue stretch and increased tissue trauma on acute and chronic post-cesarean pain," said lead researcher Ruth Landau, M.
We had divided 90 patients into 3 groups, superior incision (SI) group, superotemporal incision (STI) group, and superonasal incision (SNI) group. Surgeons have been always in search of an ideal method of making a skin incision which would provide quick and adequate exposure with minimum loss of blood. However, since 2009 in our institution, we adapted a single penile incision (SPI) to address both pathologies. Oncoplastic incisions are intended to prevent any defects after breast surgery. The aim of this study was to investigate how widening a corneal incision during IOL implantation in B-MICS affects astigmatism. Unlike today's large, mainframe-like robots that reach into the body from outside the patient, Virtual Incision's robot platform features a small, self-contained surgical device that is inserted through a single midline umbilical incision in the patient's abdomen. Pathogenecity test was done by using healthy rhizome with the help of pin prick and incision method under aseptic condition. In contrast to today's large mainframe-like robots that reach into the body from outside the patient, Virtual Incision's less-invasive robot platform design features a small, self-contained surgical device that is inserted in its entirety through a single incision in the patient's abdomen. Many authors have attempted to define minimally invasive thyroid surgery by stipulating a specific incision size. Minimally invasive TLIF uses a paramedian incision that spares the spinous process and interspinous ligament and retains the corresponding blood supply compared to the traditional open TLIF.